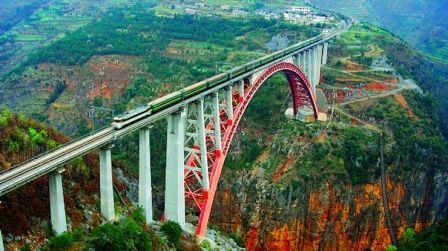 Beipanjiang River Railroad Bridge in Guizhou is an enormous railway bridge that was built as part of the much larger 'Guizhou-Shuibai Railway Project'. Connecting 2 mountains over a deep ravine, at its highest point the bridge's deck sits 918ft above the ground (to compare, at its highest point the Millau viaduct's deck clears the river underneath by 890ft). The bridge has succeeded in connecting 2 of the country's poorest areas.